Firstly, I would like to apologise to all the viewers. I began working out to get fit, but did not factor in business trips and other items which would stop me from working out or delay my overall end date. Also, didnt factor in any injuries I might sustain. I have been working out barefeet for a while now, explained my symptoms to a doctor friend and his only words were “why the hell would you workout barefeet??”. To which I replied “its what the cavemen used to do?”. Well not actual working out, they do not have a DVD player to play the DVDs. Nor do they have a telly for that matter. Actually even if they did, not sure they would understand the English! Right, let’s cut this short. On a trip, feet are hurting. Taking some time off the cardio routine to give my feet a rest and hitting the gym for some weights. Might crank out a P90X3 Challenge session. See how I feel. I’ll update this post with a picture of the gym tomorrow when I am there. By the way, I am aware that I am still missing Agility X which I was meant to complete yesterday… give me a cpuple of days for the feet to rest and recover! Lets see, this morning woke up and wife was already out for a jog. When she came back she knocked out a few sets of crunches, but as I was about to start my Ab Intervals session, she thought she would join in. This made it really fun! 19 minutes flew by without even realising. So when she finally decided her abs had enough she left, by which time I had only 6 minutes left. This was great for me, as having her there pushed me to work harder but also the time went quicker as we were talking about the moves throughout the session. Its not the same when you are working out on your own. It’s not like I can have a conversation with Shaun T. I mean I normally swear at teh screen when something is REALLY burning, but otherwise I am just telling myself I can push through it. Sad but true…. SO that was Ab Intervals. I was on my own for the Speed 1.0. Which actually was a good workout today. Another day where I felt full of beans! Now I know, you might have noticed a trend, I fast on Thursdays, and doing three workouts on a day I am fasting is probably not the best idea. But I need to make sure I am keeping up with the program. That being said however I may just take Sunday off entirely and start my next Focus T25 week from Monday, which would then put my doubles day on a Friday. I’ll have a think about it before making the change. OK, so I think this is the first time I have managed both workouts in the morning. Normally I leave one for tomorrow, but not today! Nuh uh! I went like a trooper! I didnt get time to do this one this evening. I will try and make up for it tomorrow if I can. But I am not holding my breath. Have a lot happening this weekend. But will keep updating regardless. If its not about the fitness (it should always be about fitness I hear you cry!) Then I have some other stuff I need to blog. Have a great day whatever you’re doing! All I can say is WOW! I think my diet has been spot on for a few days now, and energy was replenished fully today. Let’s get cracking with the details! So what changes did I make today?! I went for Gold! I tried not to modify anything… So normally my arms are jelly and I have to drop to my knees during the tap push ups, today was better for me! I dug deep, and made sure I stayed with the normal push ups and I am thankful I did. Just to make it clear I was a little bit slower, I think I did one less rep than the rest on the screen. OK maybe two less reps. But the fact here is, people, I did normal push ups all the way to the Burnout. Which made me feel amazing! 5 weeks in and now I can really see the difference in my fitness. The fact I can do what I did today is great news. My back is still hurting, and I think I need to stretch it more everyday. But that is something I need to work into an everyday routine, like perhaps before I go to bed. Will see if I can add in in today, the only problem is that I end up sweating, so will have to think this through. Did I mention I used the push up stands during the shoulder tap routine? This allowed me to into a deeper press up! OK, am I the only pone who thinks this is a great session to end with. You get an awesome routine to start with, Total Body Circuit. It gets your heart rate up, covers exercising all muscles and then hits you with a great cardio session. Then you follow that with Pilates X, and you have the muscle stretches and extensions. This really helped me, it didn’t cool me down, but instead kept my heart rate up with the different moves under tension. I love the lower back session, it’s only a few moves, I’d have preferred to have seen this for at least 10 minutes, but I’ll take what I can get. Clam Killer is still testing my core. I need a stronger core so I can stay on in the one arm plank for longer. This is going to be the key to future success in any of these workouts. It’s slow going but getting there. I managed to do a couple before failure on both sides…. Right, well, that’s all for now, I was going to upload a picture of my mat after I had finished the workout. But who wants to see a sweat stain?! If you do, I’ll update he post with it… Otherwise, keep up the good work! 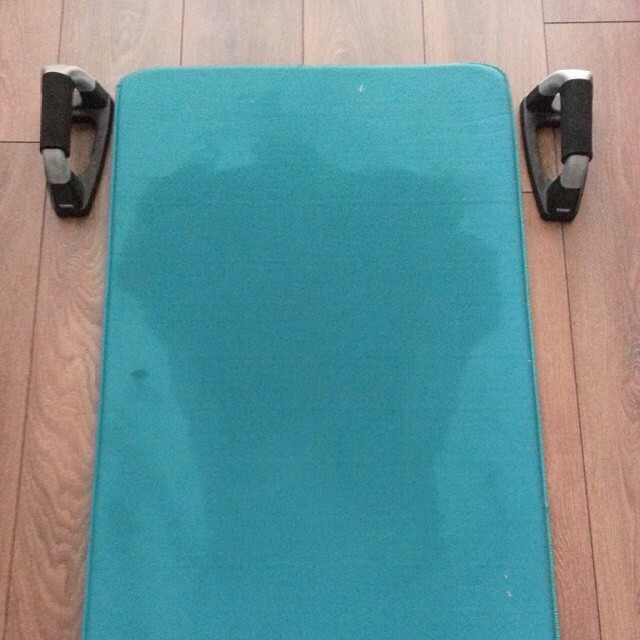 One sweaty mat and the stands that helped push me into deeper push ups! Feet were very sore this morning, to the point where heels and Achilles had some pain. Because of this I had to take it easy with the calf raises during the Focus T25 Lower Focus session. Towards the end the pain subsided, and I think the heel pain was just that I need to get the feet used to walking around again, and tried not to do anything where I was landing on the heel. The Achilles just seemed to need a good stretch, I tried to do this before I started the session, and honestly I thought I had done it, but I think it cooled down before I began. But like I said it was fine towards the end. So I gave it 100% regardless. Progress wise, I am trying to not only keep up with everyone on the screen but also trying to change certain things to get a better workout. Like for example when doing squats, I put my arms out in front. This allows me to keep my back straight and go deeper into the squat. So there’s a top tip! Reach your arms out in front when doing squats, helps keep your back straight, and you’ll keep the weight in the heel. Another top tip, you may hear this all the time, but it’s true: Tighten the core in any lunge or squat to keep your back protected! Isometrix came first today. I wanted to give this my all as I had not really had a chance to try it out. Went well apart from Bounds Dog with the Leg Lift, how the heck do you guys balance on the arm and keg on the SAME side?! Had a very hard time getting it right. I have never mentioned how I write all these blog’s. So I finish my workout, go straight for a protein shake and just relax, whilst relaxing, crank up the laptop and start typing. This allows me to cool down enough, so when I step out of the shower I am ready for either bed or reading a chapter of something. At the moment, reading a book called Dodger by Terry Pratchett. One of my favourite authors. Anywho, lets get to the workouts! So back to Isometrix, this is like the balance routine from X3 Yoga, but magnified with intensity! I really enjoyed this routing, and could see myself putting the DVD on at any given time. It has joined the ranks of X3 Yoga and Pilates for a good workout, but something that’s not energetic. So each of the moves are 45s, and you do two different exercises back to back, switching sides. Then you repeat with the other sides, sounds easy enough. Did I tell you that you have to hold the positions for 45s? I did, and you still think it’s easy? Give it a try and comment below to let me know how you got on! This is a solid routine, I broke a sweat by the second move Standing Leg Extension. Get ready for some fun! Now for Cardio! I managed to keep up with the rest, although I did have to ease up a little as my Achilles was killing! Eased up for about 5 minutes, let the pain subside made sure it was OK and then cracked on with the rest of the workout. Yes indeed, I am still working out barefoot! This seems to work for me. I have a foam mat for cushioning if I need it, but otherwise I workout on laminate… Keep up the good work people!! This was my evening session. This one is now a firm favourite of mine. Like he says you can put this DVD on at any time. I agree, I can see myself using this DVD even after the P90X3 blocks are completed.Not much else to say other than, hip flexors are still tight, so I still can’t do much with the leg raises, but I give it my best. Stretch and Flexibility will be the goal towards the end of this! Is anyone else out there having a hard time with the final move in Pilates X? 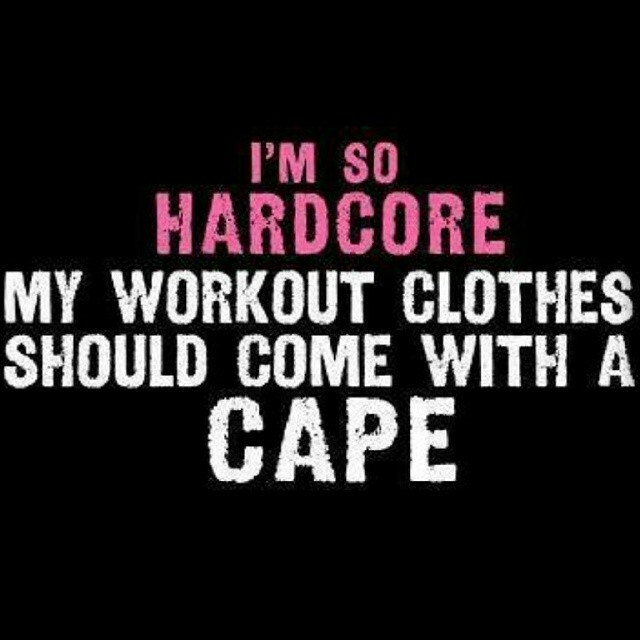 This is how you should feel after every workout!